Hospital CIOs know migration to the cloud for healthcare is inevitable. But security of sensitive patient records and compliance with federal health and privacy regulations, including HIPAA-mandated business associate agreements, can make the flight path bumpy. 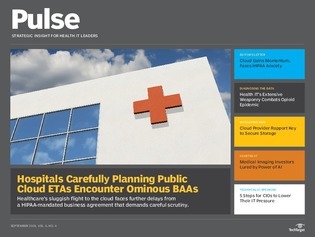 Inside this issue of Pulse, learn more about why healthcare organizations and their IT decision-makers have to balance the need to modernize with the concerns for patient privacy. You’ll also read about the rise of AI in medical imaging, which is attracting significant investments.